It's been making the rounds on the 'net and "awfuldumb" has not been very forthcoming with answers. Those answers they have parted with have been disingenuous and ridiculous. This is how they typically respond when they don't have an answer, or don't want to. It's called reductio ad absurdum, and it's a fallacious form of logic used by people who think they are superior to those asking the questions. I really hate when these puffed-up jerks think they are smarter than all the rest of us. So, how about some real answers. After all, they've pulled out everything from cosmic rays to alien bonfires to avoid giving the folks who paid for the toys any real information, because they think you and I are too stupid to 1) know the difference, and 2) figure it out for ourselves, without "awfuldumb" spoon-feeding us what we are to believe. To begin with, a bit of my credentials: I have a degree in Radio/TV/Film (before they called it mass media) and 35 years of experience as a photographer, videographer and cinematographer. I am proficient in lens theory and have a solid working knowledge of CCD imaging sensors. In other words, I know a little about the subject. 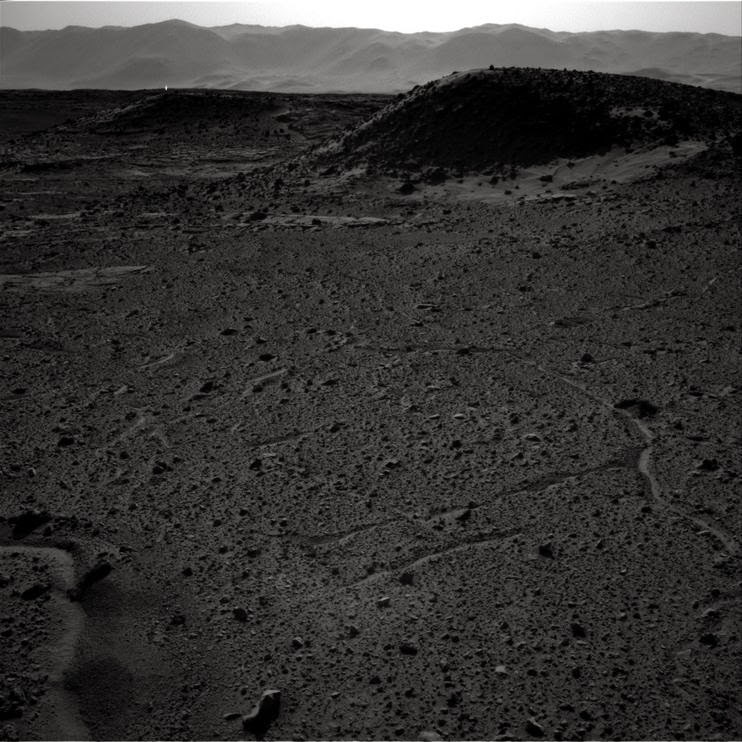 Next, the "light on Mars" is an imaging artifact, but not in the way they are telling us. 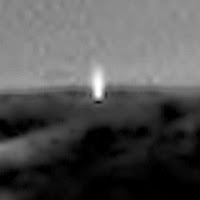 It is an imaging artifact caused by an actual point-source of light on the horizon overloading the sensors. If you want the longer explanation, please stick around and I'll tell you how this is true. First, the MastCam tool on the rover is two cameras, commonly called "left eye" and "right eye," with different focal lengths and f-stops. The "left eye" is a 10mm lens with an f-stop of 8 (f/8). What this means to you and me is that the lens is 10mm long from the outside edge of the glass to the focal plane where the image has the sharpest focus. The human eye sees roughly equivalent to a 50mm lens. A smaller number is what we call "wide angle", and a larger number is "narrow angle" or "zoom." The "fish eye" lens, or extreme wide angle is about 8mm. So, now we have a frame of reference. The "left eye" is a wide angle lens, and with an f-stop of 8, that would give us a good exposure on a partly cloudy day with diffuse sunlight. The "right eye" is a 100mm lens with f-stop of 10 (f/10). What we know now is that the lens is 10x longer than the "left eye" and the amount of glass blocks more light, so the iris aperture (f-stop) must open more to provide the same illumination that the "left eye" does. Therefore, the "right eye" is a zoom lens that requires more light to make an image because the amount of glass used in the lens blocks more light. One other bit of important information is the "contrast ratio." All imagining devices, including the human eye, have a ratio of light to dark where detail can be seen. You can demonstrate this by walking from the bright outdoors into a darkened room. At first, you see almost nothing, but as your eyes adjust more and more detail will emerge. The contrast ratio is a sliding scale of light to dark in which the eye or sensor can see detail. Below the scale is black, and above it is pure white. At both ends, no detail can be seen in those areas. The human eye has a ratio of between 400:1 and 10,000:1, depending on which source you check. The commonly used value is 2,000:1, meaning that in any scene, the eye can see detail in objects that are either 2,000x brighter or darker than the average light in the scene. Typically, if something goes off the top of the scale, we call that "glare", "flare" or "glint." The average HD-CCD chips have a contrast ratio of 2,500:1, or roughly equal to the human eye (the old TV system was 30:1). It's important to note that sensors designed to record visible light are not sensitive to "cosmic rays". Those types of radiation generally cause a fogging effect in the image where focus appears to be lost. They don't cause bright flares or glints. The important thing to remember about contrast ratio is that it is dynamic (moving up and down depending on f-stop aperture opening). Contrast is where we get detailed information, such as texture, depth and so on. Finally, at the extreme ends of the ratio, we only see black or pure white with no detail. So now we have a working idea of how cameras and sensors work and we can analyze the Mars photo - and NASA's disingenuous non-answers - intelligently. First, they tell us that there are two photos - one from the "left eye" and one from the "right eye". The "right eye" shows a bright spot on the horizon line, while the "left" does not, even though the images were taken either at the same time (phys.org) or a second apart (nasa.gov). Either way, it doesn't matter. Zoom lens (right eye) compress distance so that various distances appear to be piled on top of each other. Since the right eye is "zoomed" in, it would make distant objects appear larger and closer than a normal or wide-angler lens. Thus, simultaneous photos of the same scene using a wide and zoom lens would "see" different things, including point sources of light. What is a large and bright object in the zoom image would be tiny and probably less than one pixel in the wide image. A point-source of light in the zoom image would look large and might fall off the top of the contrast ratio, while in the wide lens, it may not even be visible, much less exceed the contrast ratio. Furthermore, the "left" and "right" eyes may have the same contrast ratios, but the different f-stops mean that the top and bottom of the scales are different. What may appear normal in the "left eye" would flare or glare in the "right eye" because white end of the scale is higher in the "left" than in the "right". So, there are two primary mechanisms at work here. Both cameras have similar resolutions (1200x1200 dpi), but they have widely varying focal lengths (10x versus 100x) and f-stops (f/8 versus f/10). This means that the way the two imagers will have different distance compression and contrast ratios, meaning that both cameras could image the same scene at the same time and have glare in the "right eye", but not in the "left". One last point: having spent many hours trying to figure out where glare is coming from in a frame, I know that glare has different characteristics depending on whether it is caused by reflection or a direct source. A reflection generally causes glare (in electronic sensors) with spikes all the way around in even numbers (2, 4, 6, etc.). Reflections also tend to have the shape of either the source or the reflecting surface, so that square sources appear square and round sources appear round. The sun or a light source reflecting off a surface will make a star-burst pattern and will often have a shape. A direct source will look like a blob because the sensor is picking up the full amount of light, rather than a reduced amount caused by scattering off the reflecting surface. Now look at the photo at the beginning of the glare from Mars. Notice that the glare appears to be a vertical rectangle with two spikes coming out from either side. I interpret this as being a reflection off a square or rectangular surface that exceeds the contrast ratio of the sensor. Since the lighting looks to be fairly low (not mid-day), the source must be more than 2,500 steps brighter than the ambient light in the scene - like a large spotlight or the sun on a surface. Since the glare is geometric, the reflecting surface must be geometric and small enough so that the entire surface is reflecting light toward the camera. Conclusions: the glare is from a real object and not a sensor artifact from "cosmic rays". The glare is reflection and not a direct source. The reflection is a couple of thousand times brighter than the general lighting in the scene in order to cause glare. The reflecting surface is geometric and relatively small. Finally, due to different lens focal lengths and f-stops (distance compression and contrast ratio), it is quite feasible for the glare to appear in the zoom image, but not in the wide-angle image, even if they were taken at the exact same moment. It is also possible that the reflecting surface is so small that the distance between the lenses would be enough that one would be in the direct path of the reflected light, while the other is not, especially given the distance. Speculation: The reflecting surface is not a natural object - it is geometric. The light source being reflected is very bright - could be the sun (if the angle is right) or a large studio light designed to illuminate large areas (5kW or 10kW fresnel instrument). The glare disappeared in subsequent frames because, 1) the rover or MastCam moved, 2) the source moved, 3) the source was turned off, or 4) the reflecting surface changed in some way. Given the small size of the glare relative to the overall image size, it would not take much movement in any component to eliminate the glare. In order to create a glare that is geometric, the surface would have to be very smooth and shiny. A rough or uneven surface would cause too much refraction and would not create a glare in the first place, especially at the distance implied by the image. Materials that could do this would be polished metal, glass and similar materials not found in Nature. 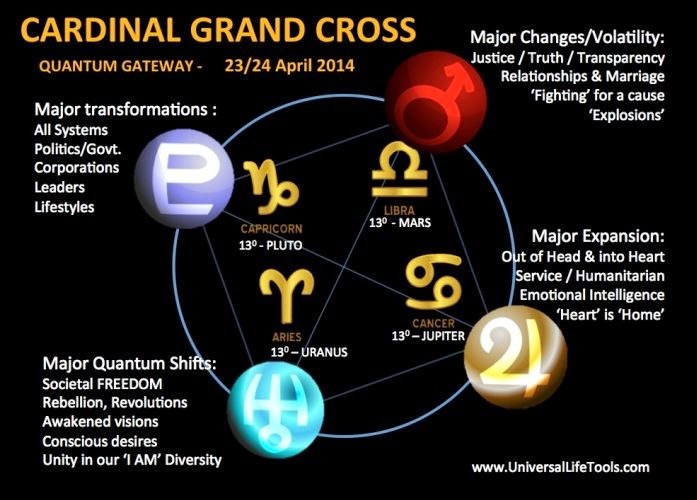 A lot of talk lately about a Cardinal Grand Cross (CGC) in the heavens, with eclipses on either side of the CGC peak. I don't know that you follow astrology, but even if you don't, you've probably heard something about this particular alignment. Before we begin, let's define what we are talking about. It might help to clarify our thinking. Basically, a CGC means that four planets have taken up positions at each of the celestial cardinal point (0, 90, 180, 270 degrees). In more concrete terms, Mars is in Libra, Uranus in Aries, Pluto in Capricorn, and Jupiter in Cancer. Those four signs are the astrological equivalent of North, South, East, and West, or the Cardinal points. I see little benefit in going into all the meanings and interpretations of the planets and the signs. You are welcome to go research all that for yourself. Suffice it to say that Grand Crosses, and particularly Cardinal Grand Crosses, are generally considered omens of bad things, since the forces represented by the signs and planets oppose each other and cancel out. Thus, efforts get frustrated, communications run afoul and everything generally gets screwed up. Put an eclipse on either side of the CGC peak, and well...you get the point. For most of my life, I've put little or no stock in astrology. Having been indoctrinated into Socratic Materialism, I scoffed at the ability of balls of rock and gas swirling around in a soup of astrologisms (constellations) to affect anything in or about my life. Like many people, I figured that most of the clap-trap out there that occasionally aligned with actual events was due in large part to the general and non-committal language of "predictions". In the past decade or so, I have been migrating to a much more Platonic weltanschauung. 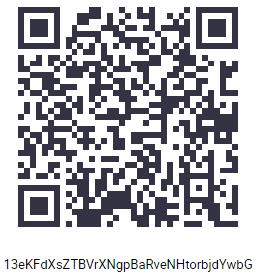 This is due in large part to my studies of hyperdimensional and quantum physics. It turns out that unseen and non-sensical forces can have profound affect on the thing we commonly call 'reality'. We all know that what we say and do ripples into the world and causes changes in 'reality'. Even at the macro scale, we talk about the 'butterfly effect' and similar ideas, where small actions can snowball into large events. Now imagine the ripple effect, only in the fabric of space-time, or the aether, as they used to call it. All these massive planets swirling around and spinning is causing more or less constant ripples in the very fabric of the Universe, and the trillions upon trillions of bodies in the Universe are all radiating ripples into the medium. If you've ever played with sound and liquids, then you know about standing waves. You can create and 'freeze' patterns in liquids using the vibrations of sound. The patterns are as unique and intricate as a fingerprint and change according to the frequency of the sound and the type of liquid being vibrated. The more sources of vibration you have, the more complex the patterns of standing waves. These patterns can be thought of as templates. Even in complex and seemingly random events, patterns tend to emerge. The interactions of isolated random events tend to create unified patterns on a macro scale. This has been observed even at the micro and quantum scales, as well. Thus, it makes sense that the background stars tend to form certain patterns that change based on Earth's position in its orbit. When we are over in Leo's part of the sky, the vibrations will be different than when we are in Scorpio's. Those background patterns are further influenced by the local planets and how their vibrations resonate with the background sky. One can imagine a sort of 'standard' template generated by cosmic vibrations, with various perturbations caused by local phenomena. In effect, we live in an ever-changing soup of vibrational templates, but even in the choas, patterns emerge. When folks like Richard Hoagland or Joseph Farrell talk about hyperdimensional physics and astrology being a degraded remnant of ancient advanced science, one can start to appreciate a much more interesting and interconnected Universe than the mainstream Newtonian vacuum called "space". In this way, though I shy away from the New-Agey rubbish, I can appreciate a scientific basis for the theory that the positions and interactions of the Universe around us can manifest in various ways in our 'reality'. Perhaps it's a general disposition to certain emotions, or that complex mass human interactions can start to form patterns in the chaotic soup we call life. Over vast amounts of time, with meticulous record-keeping, we might even be able to catalog a predisposition for certain events to occur around certain alignments. It is even conceivable that these predispositions have been cataloged over millions of years, if the alternative historians are correct. And potentially, there are secret societies that preserve those ancient catalogs, which have been corrupted in our 'outsider' society to become astrology. So, all that being said, suppose a group of secret society members had knowledge that global financial, political and social upheavals occured around Cardinal Grand Crosses. Suppose they then manipulated things in order to take advantage of the chaos and profit. Further suppose that to make their plan work, the majority of humanity had to be in a state of fear and/or suffering. Would proof of that knowledge and effort look like today's headlines? One ray of hope is that, as mentioned before, certain alignments only set up a predisposition towards certain mass actions and reactions. This implies the corelary that certain mass actions can reverse and even benefit from what some would call 'negative' alignments. Indeed, we find in astrology that Cardinal Grand Crosses can be very negative events...unless we as a group approach this time with a positive attitude and a willingness to be introspective. In the latter case, a CGC can be a time of great advancement in spiritual and physical well-being. In this scenario, the forces that try to control humanity and feed on it would be setting up a season of fear through war and financial collapse, in order to profit from their secret knowledge of ancient science. However, we humans can counter their efforts and even thrive and defeat the bastards by maintaining positive attitudes, not buying into the fear-mongering, and looking within ourselves for our inner strengths. Even if all this is complete rubbish, can it hurt to try a little kindness and meditation? Who knows? It might even work without astrological alignments. If the astrological certainty around CGCs is massive change on both the individual and mass social levels, and that the event is neither inherently good nor bad, then it is all a matter of frame of mind to steer the outcome. From our scientific, though Platonic point of view, positive vibrations added to the standing waves/template created by the CGC would create a mass disposition towards good for all, whereas fear vibrations would dispose the world to destruction and slavery. All the more reason to turn off the TeeVee. Have you noticed anything? Do you see it also? The world changed last week, and if you weren't looking, you might have missed it. One of the most significant changes in geopolitical relations in the past 50 years flew right under the RADAR and landed smack in the middle of the Western Banking Establishment's lap. Russia, China and now India have made a gas deal that will take the US and the dollar out of the energy business in Asia. In other words, three of the hottest economies on the planet just thumbed their collective nose at Western hegemony. It was amazing to watch. Most of us alive today don't remember a time when the US was an agrarian, second-class economy. In fact, if you were born anytime during the 1950s or later, you've never known a world were the US wasn't a black hole of power and resources. That old world just ended. There is indeed a New World Order, and the neighborhood bully just got kicked out of the club. What brought the US to prominence, beside being the last man standing after WW2, was that it meant business. It created thngs and exported things and created wealth. In recent years, however, it has been a net importer, a debtor and has all but lost the innovative edge that made her name. You may have not been aware that the US has spent several decades shutting down coal, oil and gas production, preferring instead - and at great risk as the 1970s showed - to use everyone else's energy reserves. But, as the Western Banking Establishment has grown increasingly panicked, suddenly all those oil, gas and coal fields that were shut in under the guise of ecological concern are now open for business and the country is ramping up production in a huge way. At one time, the world was happy to take the US jobs and money, and were willing to take the BS that went with it. In recent times, though, the US has devolved into a militaristic mercantile empire exporting only bombs and debt, and the world has grown weary of it. Instead, they now look to Russia and China as the economic powerhouses and perceive that those countries are far more legitimate because they bring business without egregious strings attached. There are no agendas besides pure economic benefit - no ideological ham-fisted Agenda 21s or Pax Americana or nation building/regime change to go with the forced indebtedness. Furthermore, everyone except the poor duped Americans themselves see quite clearly that Obama is a self-serving, illegitimate occupant at the reins, and see even more clearly that he does not run the country. They know very well that the banksters and corporate interests set the agenda in the US, and that the country's political and legal systems are nothing more than mafioso enforcement schemes to protect the "too big to fails". Now Russia and China have entered into an energy agreement that shuts the Western oligarchs out of the deal. Soon, India will join because pipeline routes will be able to come right around any Western-controlled puppet states. This is the foundation of a new and quite seperate financial system that will force the Western banksters to their knees, or provoke them into rash military response, which will make plain to the world the illegitimacy of the empire, whose ideology is based solely on greed and avarice. Empires don't crash and burn. They fade over decades, centuries, and even millennia (c.f. Rome). The US empire will not crash. The dollar will not go up in flames. It will slowly fade away into obscurity and people find viable alternatives and adjust to new paradigms. The greatest mistake the US could make at this point is military adventurism, though that is likely what will happen, given the inbred stupidity controlling the country. There is only one real answer that the American people can give now. Don't vote. Stay away from elections in droves. This vote of "no confidence" is the only thing that can force the cockroaches into the sunlight and show them for what they are. There is no political solution at the polls, and by not voting, the oligarchs will be forced to retain power without consent and thus expose their despotism. Not voting en masse is the only peaceful means left to expose and debunk the power-mad slime. They have horrific weapons that make open conflict and revolution untenable. They control the judiciary and legal processes with unflinching fists. They even control the electoral process to the point that voting is pointless. The outcome is predetermined. Therefore, NOT voting is the only way to answer tyranny without force or immoral acts. The only way they maintain the illusion of legitimacy is by getting folks to the polls, thus fooling the rubes into thinking that their minions were selected democratically. Without the pretense of fair and open elections, they can not claim any semblance of legitimate power, and will be forced to keep power by open aggression. At that point, they have lost without a shot being fired. They would have no legitimacy either in the domestic nor global arenas. As George Carlin rightly said, you only have the right to complain if you don't participate in the fraud.